Iran's President Hassan Rouhani has vowed to break swingeing sanctions re-imposed by the US targeting core parts of the economy. Iran greeted the last tranche of US sanctions on Monday with air defence drills and a statement from President Hassan Rouhani that the nation faces a "war situation," raising Middle East tensions as the United States' maximalist approach to the Islamic Republic took hold. The new sanctions aim to hurt Iran's vital oil industry, a crucial source of hard currency for its anemic economy. Its national currency has plummeted over the last year and exports have already fallen by around one million barrels a day since May. "We are in the war situation, " Rouhani said Monday on state TV. "We are in the economic war situation. We are confronting a bullying enemy. We have to stand to win." He further stepped up the rhetoric, comparing Iran's situation in the 1980s war against Iraqi dictator Saddam Hussein with the current one and President Donald Trump's move to reinstate U.S. sanctions. "Yesterday, Saddam was in front us, today Trump is front of us. There is no difference. We must resist and win," he said. The measures follow US President Donald Trump's decision in May to pull out of the 2015 nuclear deal with Tehran, which he said was flawed and does not adequately constrain Iran's destabilising behaviour in the Middle East. Iran is already in the grip of an economic crisis. Its national currency, the rial, now trades at 150,000 to one US dollar, down from when it traded around 40,500 to US$1 a year ago. The economic chaos sparked mass anti-government protests at the end of last year which resulted in nearly 5,000 reported arrests and at least 25 people being killed. Sporadic demonstrations still continue. The United States says the sanctions are not aimed at toppling the government, but at persuading it to radically change its policies, including its support for regional militant groups and its development of long-range ballistic missiles. However, Trump's personal lawyer Rudy Giuliani and John Bolton, the president's national security adviser, both have made public statements supporting overthrowing Iran's theocratic government. Iran's Foreign Ministry spokesman Bahram Ghasemi also predicted the sanctions will actually work against America's interests. "Many countries from Europe to Russia and China have opposed the sanctions," Ghasemi told journalists, adding that Iranians "have experienced more extensive sanctions" and that they are "not a new issue." China denounced new US sanctions targeting Iran's oil and financial sectors as "long-arm jurisdiction" on Monday and vowed to continue its bilateral trade with the Islamic republic. "China opposes unilateral sanctions and long-arm jurisdiction," foreign ministry spokeswoman Hua Chunying told a regular press briefing. "We believe that China's normal cooperation (with Iran) within international law is legal and legitimate, and this shall be respected." Meanwhile, Iranian officials reported a cyberattack targeting the country's communication infrastructure, blaming the purported attack on Israel. 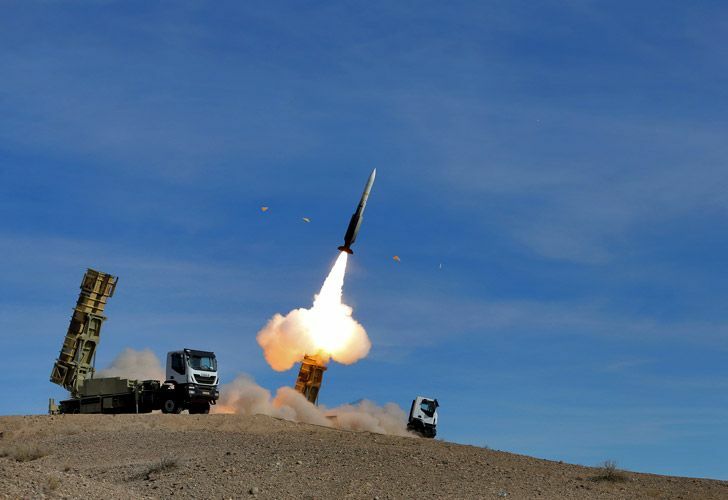 Iranian state television aired footage of air defence systems and anti-aircraft batteries in two-day military manoeuvres underway across a vast stretch of the country's north. It included surface-to-air missiles shooting down a drone. The drill was to continue through Tuesday. Iranian army Gen. Habibillah Sayyari said both the national army and the country's paramilitary Revolutionary Guard were taking part in the exercise. Israel's Foreign Ministry declined to comment on the Iranian claim. Israel's Defense Minister Avigdor Lieberman welcomed the newly restored US sanctions in a tweet, saying they will deal a "critical blow" to Iran's military presence around the Middle East. The Trump administration's decision to restore sanctions "is the sea change the Middle East has been waiting for," he said.